Today I woke up and it was horrible weather. Rain was lashing against my window, the sky was a dark grey and the tree outside was swaying in the wind. So much for that short period of lovely sunny weather. On top of the weather, today has been an essay-writing day. I particularly hate having to write essays on Sundays - I find it so hard to concentrate when the library is shut and my kitchen is at hand. 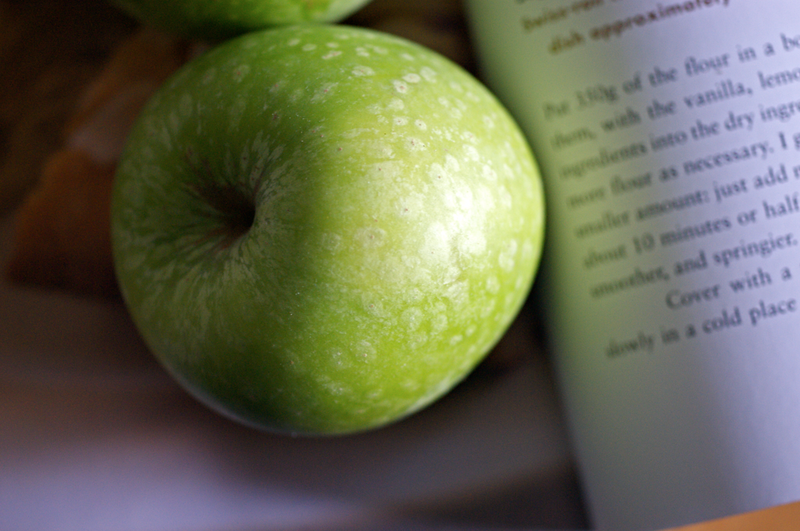 After a flick through a few recipe books, I decided to make a lovely comforting yeasty apple cake with the Granny Smiths that have been lingering in our fruit bowl. It turns out I cannot pronounce Kuchen very well - German isn't my strongpoint. My fluent flatmate tried to teach me to say it properly, but the more I try, the worse it gets. So now we've settled for the completely wrong Apple Cush-na (I have no idea where the -a ending came from...). I adore working with dough, though I don't often seem to get around to it. Kneading is such a pleasure when the dough is as lovely as this - scented, springy, smooth. It feels a bit like meditation - kneading definitely calms your mind. I made a few changes to the recipe, mostly due to what I had in the cupboard - I didn't have flaked almonds or allspice. I also don't really like plain icings, so I made a lemon one instead, which worked well. I love the way the gypsophila looks all fluffy like cotton wool in this photo below. My fluent-in-German flatmate loves it just as it is in a vase, not as a filler - at first I wasn't sure, but now I'm a convert - it's so fresh and delicate and lasts for ages. I have a fancy new cake plate, see below and top. Isn't the pattern pretty - I kind of wanted a plain one as usually I prefer having a plain background, but this one was just so delicate and lovely. Put the flour into a bowl with the salt, sugar and yeast and mix together. Beat the eggs, vanilla, zest and nutmeg together and then add to the dry ingredients and combine to make a sticky medium-soft dough. 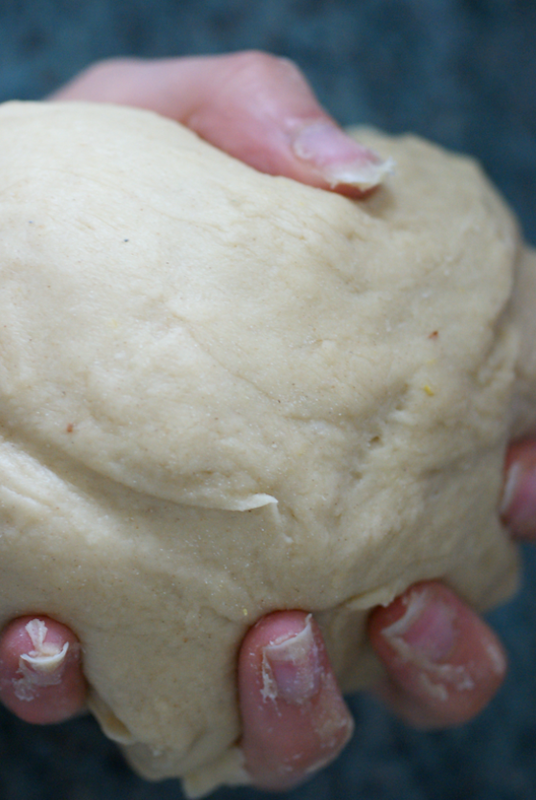 Work in the butter and knead by hand for about 10 minutes or half the time by machine. The dough should be smoother and springier when done. Put into a big bowl and leave to double somewhere warm for 1 - 1 and a half hours, or in a cold place overnight. When ready, punch down and stretch out to fit a 20 x 30 cm tin. Leave to prove for 15 minutes. Preheat the oven to 200C. Peel, core and chop the apples finely, putting them in a bowl with some water and a slice of lemon to stop then browning. Beat the egg and cream together and brush over the proved dough, then sprinkle on the ground almonds and nutmeg. 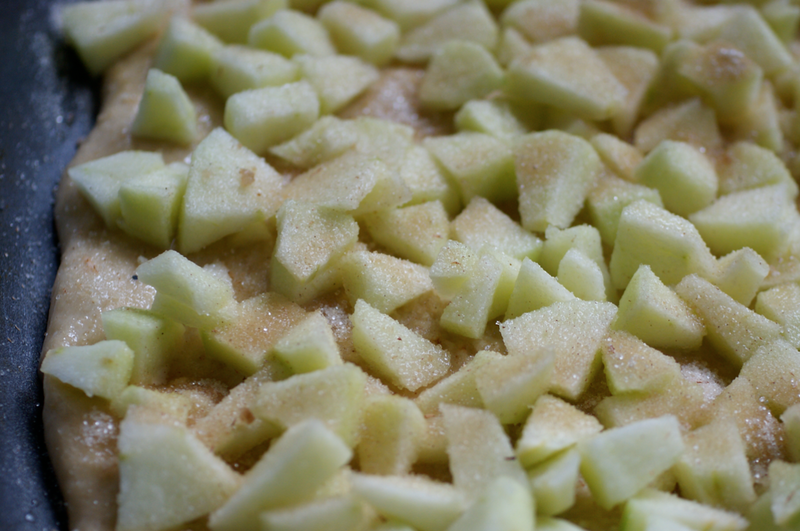 Drain the apple bits and spread them over the top. Mix the sugars, cinnamon and ginger together then sprinkle over the top. Put it in the oven for 15 minutes, then turn the oven down to 180C and bake for another 10-15 minutes. Sieve the icing sugar then mix all the ingredients together into a runny paste. Dribble over the cake. Leave to cool for 10 minutes or so then dig in. It's best warm - I pop a piece in the microwave for a tiny bit to warm a slice up on a single basis. I know, the "ch" is very hard to pronounce for non Germans and the "en" ending doesn't seem to make much sense either. So, you have my respect for trying. 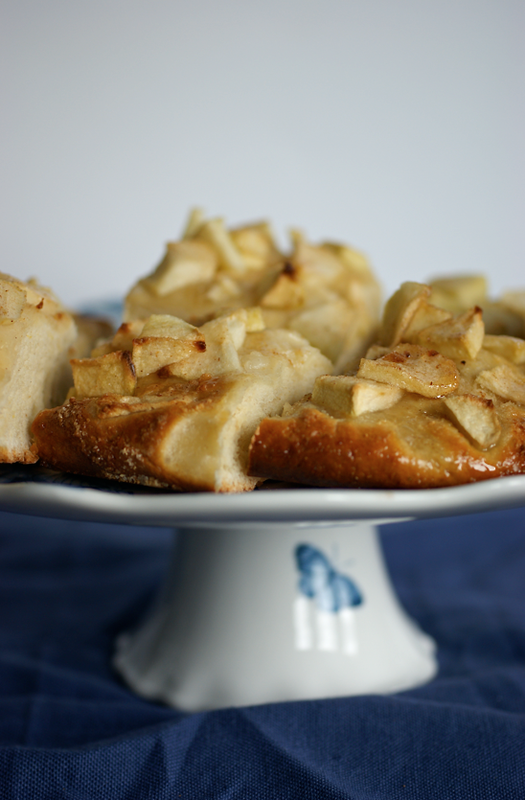 Your Apfelkuchen looks very nice. I make mine without a yeast dough. There are lots of "perfect" recipes out there. I thought about you today, because I baked a "Birnenkuchen". This looks delightful! I bet I would love this, I need to try it! What a completely gorgeous site! 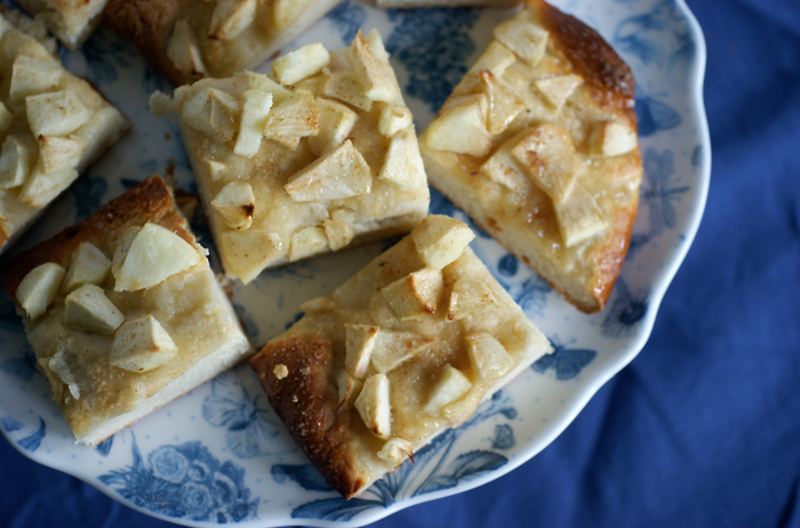 I'm all for a good apple cake recipe and I've never tried making kuchen before. Looks good, good, good! This cake looks just perfect for a rainy day like today - makes me want to do nothing apart from eat cake and watch TV :) I went on a school trip to Germany a while ago and beforehand they gave us a crash German-speaking course, mainly consisting of "kuchen" and "kaffee" so I sort of know how strange it is to prounounce! 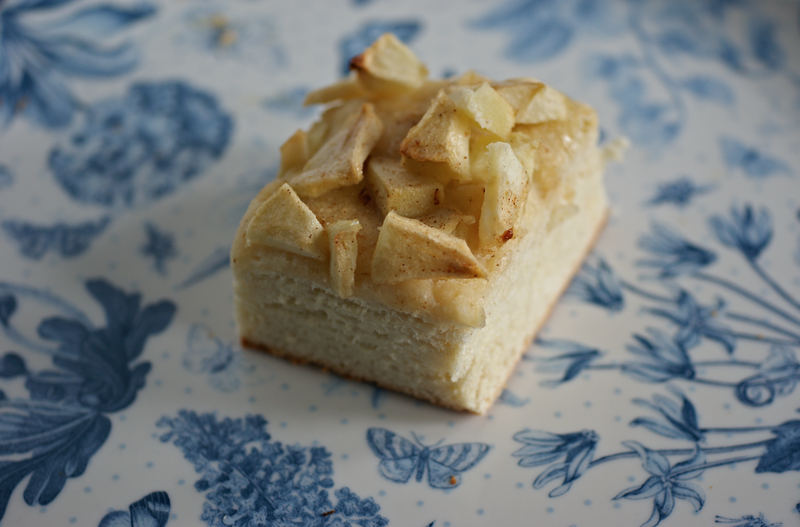 I make a similar cake, but it’s a German "Streussel", a cake like yours, but with crumbs over the apples. I love this post. 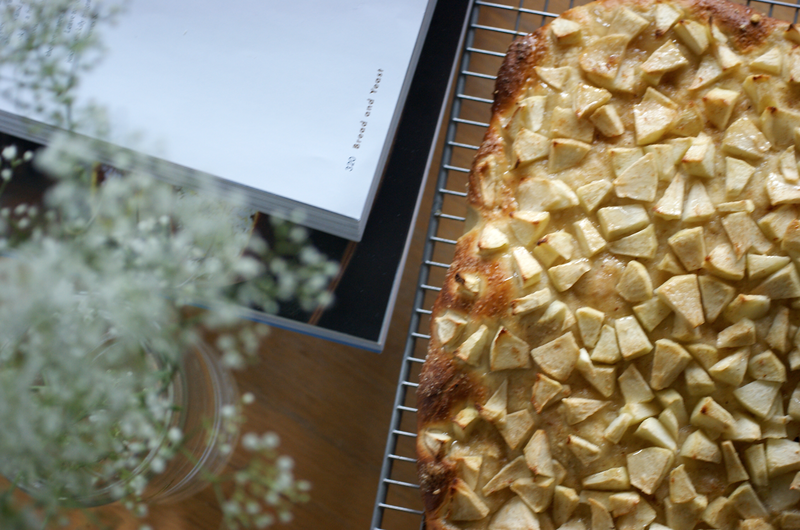 Besides admiring the beautiful apple kuchen (pronounced any way anyone likes! ), I think your photos are just wonderful. That one of you holding the dough in your fist made me smile. I, too, love working with dough that can be touched and kneaded. There's something really elemental about it, isn't there? You are a fine writer, and your style is refreshing.